Podgorica renta apartman, renta stan, Preko Morace. Nov luksuzan studio apartman, besprekorno cist i uredan, opremljen sa novim stvarima i aparatima u modernoj zgradi Carina. 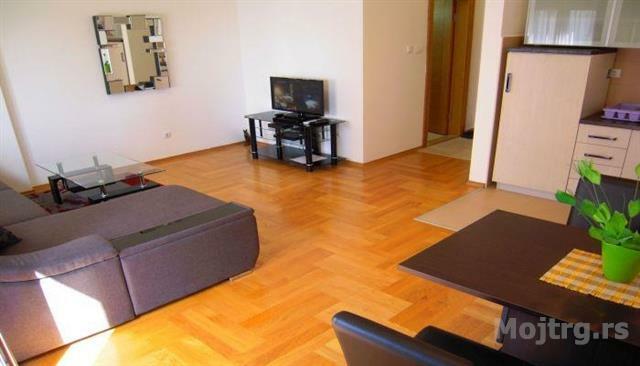 Apartman je juzno orjentisan na 3 spratu od ukupno 6 u stambenoj zgradi. Nalazi se na najljepsoj lokaciji Preko Morace na obali rijeke Morace u ul. Serdara Jola Piletica. U neposrednoj blizini zgrade nalazi se Trzni Centar Palada, restorani, barovi… Centar grada je na par koraka od apartmana. It’s very cosy, sunny, immaculately clean and tidy. Consists out of an open space living room, fully fitted open kitchen with dining room, bathroom, hall and 2 French balconies. Apartment is on the 3rd floor out of 6. The building has a lift and security cameras. Apartment is a 5 minute walk from the. The building has a secure underground garage with a lift to the apartment, security cameras, fire alarms. We offer many flats and apartments to rent in this building, Preko Morace and the City Center for short or long term.